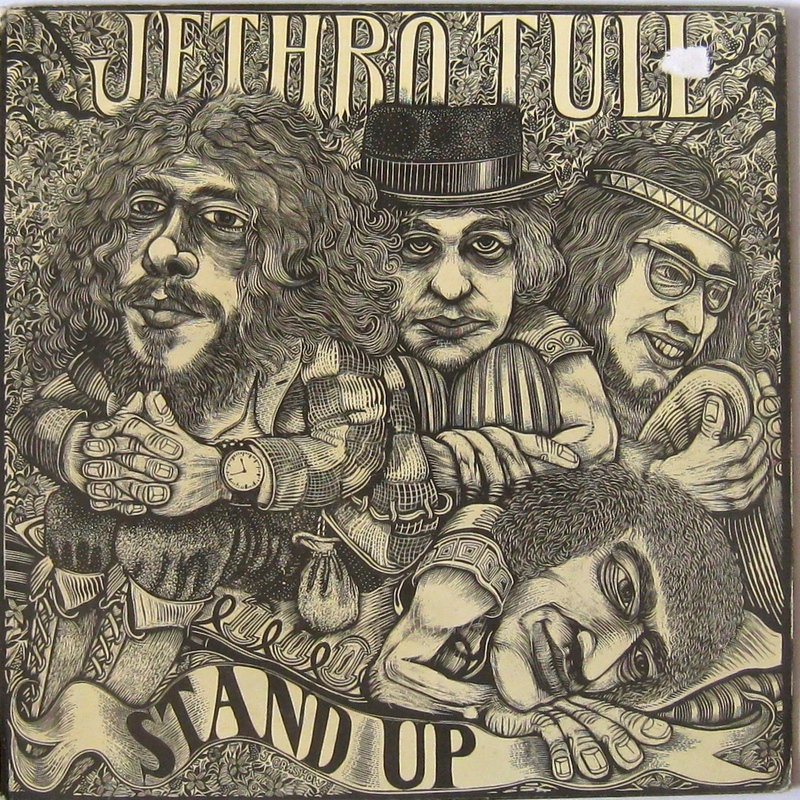 I remember buying my copy of Jethro Tull’s Stand Up at a Record Fair many years ago. The stall belonged to a guy I knew vaguely from the public radio station I presented on, 3 PBS FM. He was part of the Heavy Metal crew. Their show preceded Late Night Shopping on a Friday evening and so we were nodding acquaintances. Holding the LP in my hand I was both keen and uncertain. 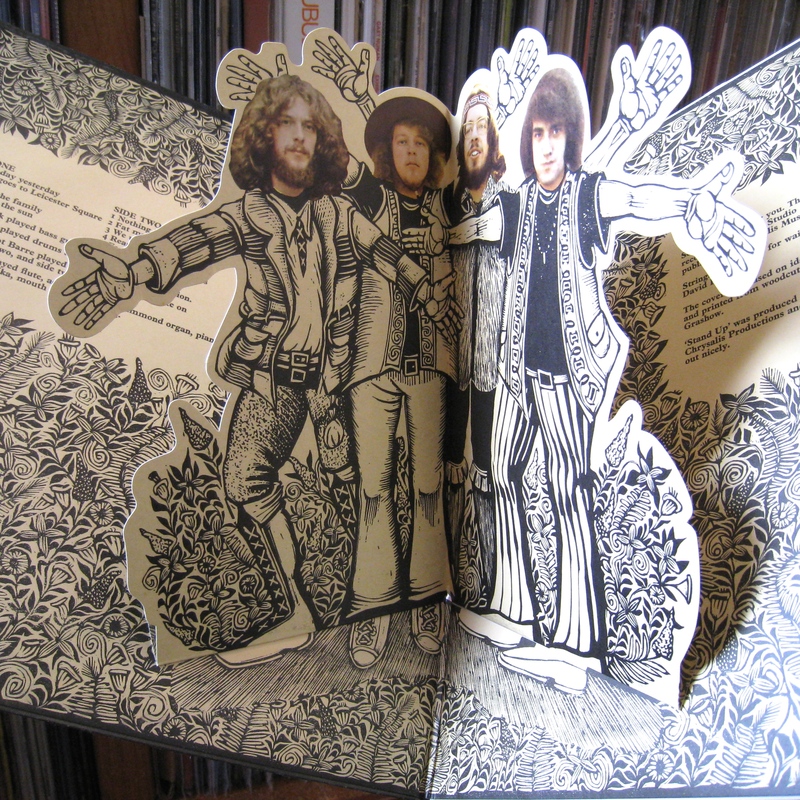 The enthusiasm was for an original 1969 copy with the stand-up figures inside the gatefold. How brilliant was that! I could lay it out next to my copy of Badger (with the stand-up badger, natch) and, well, er, look at them both standing up. Doesn’t seem quite so exciting now. Still, a UK copy on Island. But I hesitated. This wonderful cover, featuring a woodcut by New York graphic artist Jimmy Grashow (so the sleeve tells us), was wounded. A nasty price-sticker-tear on the final letter of the band’s name. I looked at the damage. I opened the gatefold. I gazed searchingly at the seller. He stared back impassively. I stared piercingly at the damaged corner. So much for public radio buddy-dom. I handed over a tenner. And, dear reader, even though I wince slightly every time my eye is drawn to that scar, I have never regretted the purchase. 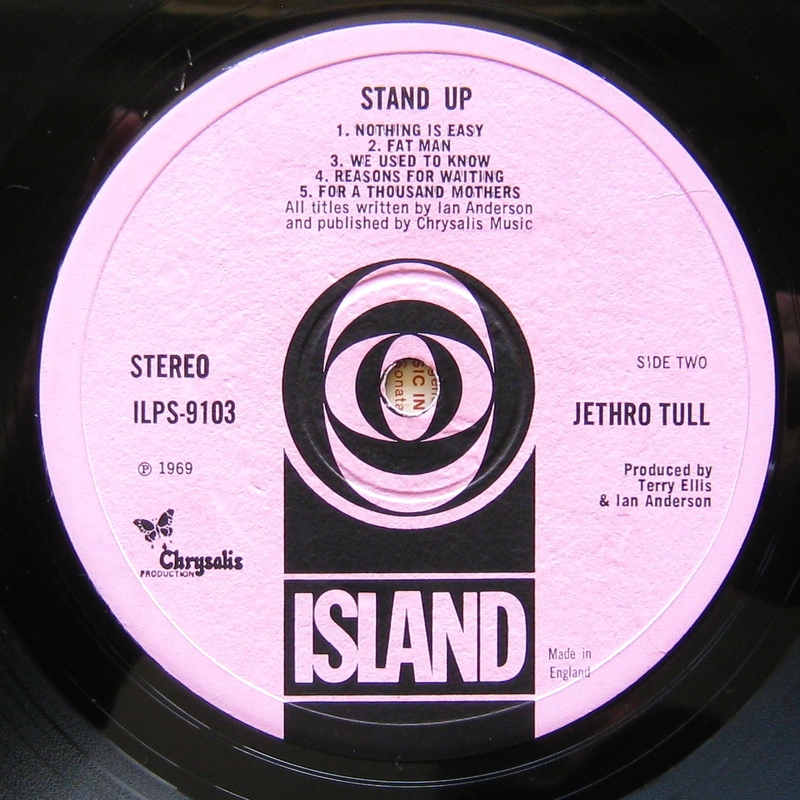 Recorded in London in April 1969 and released on 1 August that year, Tull’s second album is both a departure and a development from their first outing This Was. The blues influence is much reduced with the replacement of guitarist Mick Abrahams by Martin Barre while an early indication of leader Ian Anderson’s folk flavourings is evident in several songs. The result is an album of diverse textures, adventurous arrangements and youthful creative energy that bursts out of every groove. 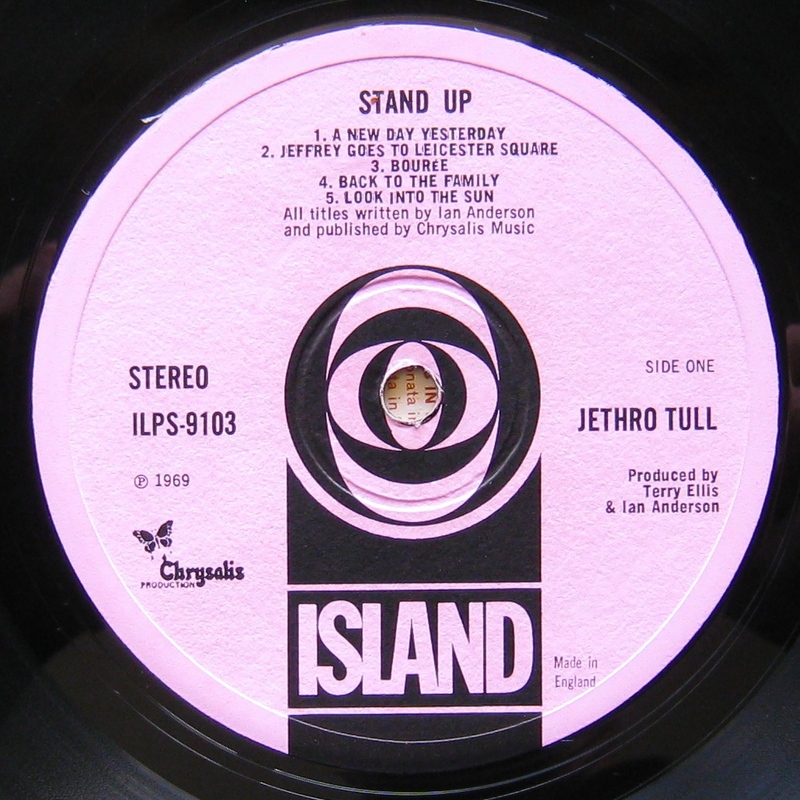 The inner sleeve tells us that Stand Up was produced by Terry Ellis (founder of Chrysalis Music) and Ian Anderson. Says Ian, “…er, well yes! It really has turned out nicely.” I can but agree. The album opens with the foreboding baseline of “A new day yesterday” before the band kicks in with guitar, harmonica (a blues tinge) and a wailing Anderson vocal. There is an angry yet world-weary tone that the leader pulls off with an aplomb belied by his tender years. Well, he was 22 and that seems young to me. Of course when I first heard Stand up, I was younger than Ian so it probably seemed impenetrably ancient and experienced. “It’s an old day now”. Whatever. The song rocks. Contrasting styles are immediately obvious on the second song. “Jeffrey goes to Leicester Square” has an eastern folk tinge that invites connection with Pentangle and their restless inclusiveness. The light percussion of “Jeffrey” is a nice introduction to the swaying classicism of “Bouree”, a flute driven instrumental that features the bass of Glen Cornick and which became a live staple. The next song, “Back to the family” is one of my favourite Anderson lyrics. Fed up with the pace and noise of the city, our protagonist heads home to the bosom of his family. But surprise, surprise, he quickly rediscovers why he left in the first place and heads back to the city. Musically, the tempo of the song accelerates in the final section like someone running away. It’s brilliant. Although I try to avoid writing about every damn song on an album, when the album is this consistent, what do you do? “Look into the sun” is an acoustic ballad that manages to embrace both hope and sadness. What a reflective way to end Side 1. “Nothing is easy” bounds along at a fast canter, the verse followed by a flute section over high-hat swish ‘n’ splash before the band kick back in. There are changes in time and tempo that carry you along like a frisky pony. I love the pay-off after the repeated phrase “Nothing’s easy” where the instrumental three note punch seems to reply “It is-n’t!”. The song finishes with one of those build-up/crash out finales that are common in live performance. And it just gets better with “Fat Man” coming next, its eastern flavoured mandolin lines and pattering tabla exploring some mysterious connection between exotic rhythms and over-eating. 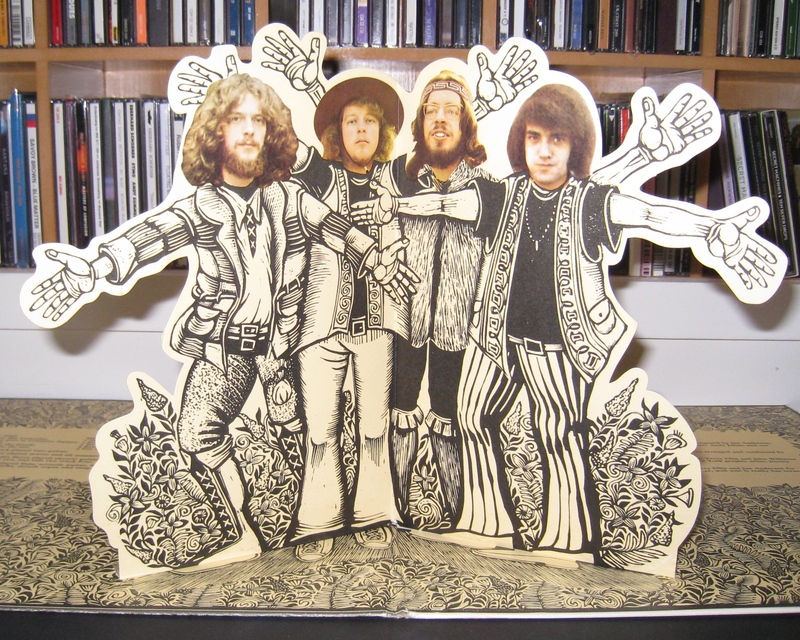 With rocking album closer “For a Thousand Mothers” we get some of the harder edges that have provided much of Jethro Tull’s long term power. There’s even an instrumental coda where the band strut their chops into a satisfying fade-out. Just to complete the circle, let’s return to that wonderful woodblock print on the front cover. Therein lies a clue to Ian Anderson’s dexterity on the impressive range of instruments listed on the cover (flute, acoustic guitar, Hammond organ, piano, mandolin, balalaika, mouth organ). Have a look; he is endowed with digits beyond the normal allocation. Another mystery solved. 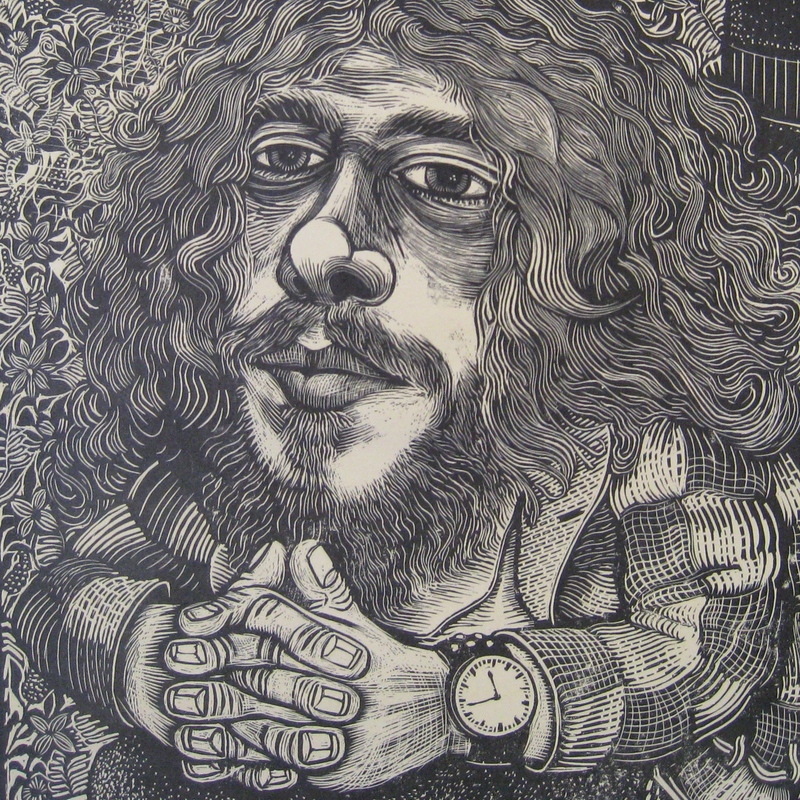 Jethro Tull’s second album is diverse, direct, and brilliantly inventive. All the pointers are there for subsequent directions but here it’s present and correct with none of the posturing or indulgence that bedevilled later work. Did they Stand Up? Indeed they did. “Give me your hands cause you’re wonderful”. Mr A returns to a traditional number of digits. Thanks to Larry W for the reminder of multi-instrumentalist Ian Anderson’s well-endowed hands. Haven’t thought about Tull in a while; nice to be reminded of the talent and diversity of style. Pretty fond of early Jethro around these parts. This one in particular is worthy of revisiting. Thanks as always, DD. It’s funny and odd, isn’t it? And once you’ve noticed, impossible to not see! Entirely with you on the albums. One is a solid, but basically an of-its-time blues based workout. Two really sparks. Yes it really does. I think Ian Anderson say finding his feet as a songwriter on Stand Up. Are you a fan of Tull throughout their career or is there a particular era you like best? That question really got me thinking. I had a look at the shelves and found just over 20 Tull titles, which suggests a reasonable level of commitment. But really only up to the early 80s. Recently I gave “Minstrel in the Gallery” a spin and liked it so much I played it again. These days, that’s a major vote in favour. That’s the problem really, with a vast artist catalogue. Some of it really is best avoided. But Stand Up should be snapped up, given a chance! So cool! I’ve never seen this album cover before. Thanks for sharing it. It is an excellent cover, isn’t it? And one of my favourite Jethro Tull albums. Actually, I think it is my fave. Yes! A very enjoyable post, thank you. That is such a cool album cover. 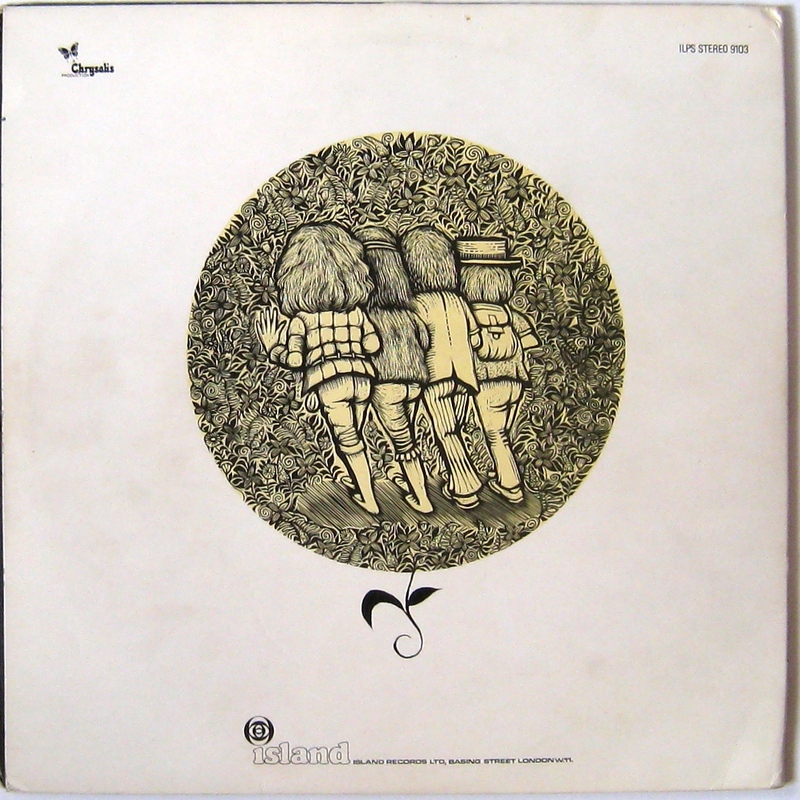 Another thing we miss about 1960s records! Thanks for visiting, jamiegodo. Yep, album covers are a big part of the enduring romance of vinyl! I have these fab LP frames in my house where you can frame your favourite records. I have bought them for a few friends too. You don’t even get to see the artwork on some new releases now! CB wore out these early Tull records. I still reach for this one on a regular basis. Good is good. Tull had their own sound and I dug it.